A Silver Mt. 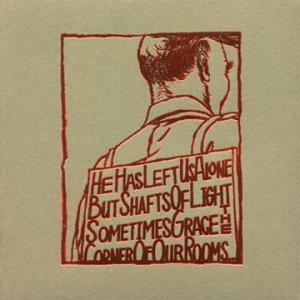 Zion - "He Has Left Us Alone But Shafts of Light Sometimes Grace the Corners of Our Rooms"
A Silver Mt. Zion is the side project of three members of Montreal's Godspeed You Black Emperor!, and as such, has much in common with the sound of that collective. Pared down to the trio of Efrim Menuck on piano, guitar, vocals, organ, and radio; Theirry Amar on contrabass and electric bass; and Sophie Trudeau on violin and vocals, the sound is much sparser and more reflective than Godspeed's sound. In fact, the music has far more to do with classical music than it does with rock. As a whole, He Has Left Us Alone... works nicely as background music, but fails to grab the listener in the way GYBE! 's Lift Your Skinny Fists... album does (and what is it with these awkwardly long titles?). It reminded me at times, of an album released in the 80's, This Mortal Coil's Filigree and Shadow. It has the same dark, melancholic feel, similar classical stylings, with occasional forays into stronger, machine-like rhythms. The major difference is far less in the way of vocals on He Has Left Us Alone... In fact, there are only two truly vocal tracks with lyrics, on the album. Long March Rocket or Doomed Airliner has a chilling, hypnotic quality to it. The vocals are sparse, brief, and almost whispered. Movie (Never Made), on the other hand, features a weak, and often irritating vocal by Menuck (I assume it's Menuck, since the voice is male, and Amar has no vocal credits). The album constantly returns to the same musical motif of reverb heavy, morose piano notes plunking over a low, humming drone. It's this repetition that tends to relegate the album to background noise. The very thing that made This Mortal Coil's album work so well, or for that matter, GYBE! 's Lift Your Skinny Fists... album, was in the way it maintained such a consistent feel, while exploring so many variations in sound. As with GYBE!, voice and sound samples fade in and out, giving the music a dreamy quality, but what is the obsession that bands like this seem to have with samples of half-crazed sounding southern preachers going on about Jesus and God? Is it reverence? Criticism? Mockery? I'm never sure, because the samples rarely seem to be used in any sort of context, and the same can be said for He Has Left Us Alone... The most overt use of this kind of sample is on the first two tracks titled Broken Chords Can Sing a Little, and Sit in the Middle of Three Galloping Dogs. Like I said, no context. All this is not to say that there aren't some exceptionally beautiful and vulnerable moments on this CD. One of those extended moments is 13 Angels Standing Guard 'Round the Side of Your Bed. With a child-like, wordless vocal mantra from Trudeau that is increasingly processed till the climax of the piece, and the gentle washes of noise, stuttering bassline, and haunting violin the piece has a wonderful, space-like and enchanting feel to it, like gazing out the window of your childhood bedroom at the starry night. Yet it also seems to be mourning for the loss of those innocent days. And therein lies the heart of He Has Left Us Alone... Loss. The album is dedicated to Menuck's beloved dog Wanda, who died of cancer. The final piece of the album, For Wanda, features the same piano notes as many of the other tracks, but in this one, they are a little lighter, and one can almost see the rays of light gracing the corners of rooms. If you have Lift Your Skinny Fists Like Antennas to Heaven, this makes for a nice companion CD. If you don't, do yourself a favour and pick Lift... up first before delving into this disc. For more information you can visit the official Godspeed You Black Emperor! web site. Contact the band by snail mail at PO Box 2; Place-du-parc; Montréal, PQ H2W 2N9; Canada. You can visit Constellation Records at their web site. Contact via snail at Constellation Records; PO Box 42002; Montréal, PQ H2W 2T3; Canada.